Ash Wednesday marks the beginning of Lent this week. As a long-time lover of classical art and the Old Masters, I spent many hours in years gone by browsing city art museums in eastern and western Europe while Jim and his students visited financial institutions. I quickly became very fond of the work of Pieter Bruegel the Elder, particularly his detailed genre paintings packed with the busy goings-on of typical Flemish life scenes and situations. Much of his work is not religious, but The Fight Between Carnival and Lent, which I have not seen in person, depicts a Shrove Tuesday battle featuring 200 townspeople. We consider Bruegel’s painting this week as Christians around the world are about to begin the annual 40-day observance of Lent. Back in 1569 when he created this work with oil on wood, the period of Lent presumed preparation for the miracle of Easter, the time of annual communion, which had to be prefaced by penitence and a new rhythm, with deprivations to begin on Ash Wednesday. Carnival marked the last day to eat fat and meat before Lent’s arrival; this painting brings to life the tension between typical behaviors and the more restrained ways of being during the self-reflective period of Lenten fasting. Bruegel painted at the height of the Protestant Reformation, a time of great religious unrest, when old customs were beginning to crumble. While Protestant reformers criticized the traditional Catholic ways, religious leaders on both sides disparaged the spirit of Carnival: Catholics disliked Carnival’s parodies of church ritual, while Protestants disapproved of the excesses of Carnival and its Pagan origins, according to art historian Andrew Graham-Dixon. The artist portrays that moment in the liturgical year “when the last feast of winter must give way to Lenten fasting,” with the left half of the painting representing over-indulgence and excess (Carnival), while the right half symbolizes self-denial and sobriety (Lent). 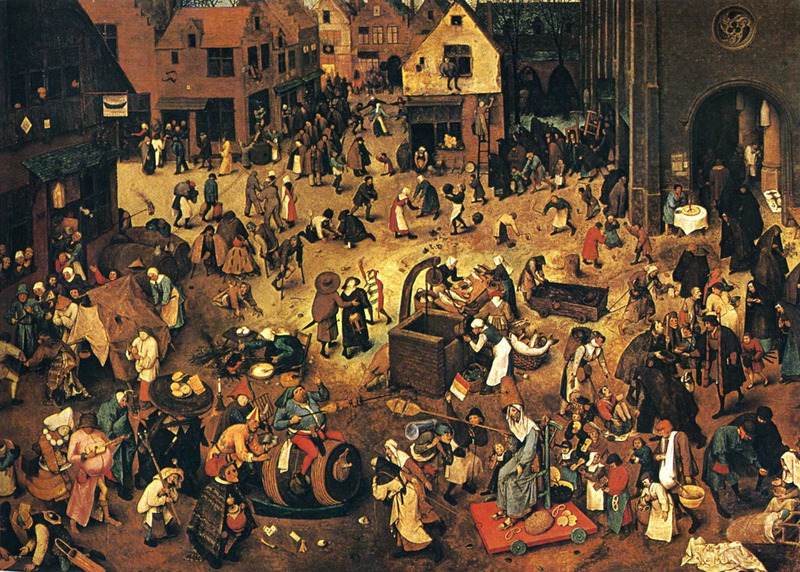 Merriment is under way on the left side of the painting, where a tavern hosts a festive parade, while worshippers marked with ashes leave the church in the upper right corner. The church’s statues are already veiled for the season of Lent and a priest hears confession, even as a woman spring cleans her exterior windows nearby, signaling the changes that take place in Lent. In the central front portion of the painting, a mock battle plays out between an obese man (Carnival) straddling a barrel and an emaciated nun (Lent) wearing a beehive on her head (symbolizing the church). Waffles and pancakes, sausages and meats appear on the Carnival side, while figures on the Lent side carry simpler foods like pretzels, breads, and fish. Fancy costumes and masks are evident on the Carnival side; Lenten figures are dressed more ordinarily. “Bruegel’s view of the customs that he so vividly recreated is hard to establish, although there is a clue perhaps in the elevated perspective from which he has chosen to look down on the scene. I suspect his attitude to popular faith and festivity may have been one of amused but affectionate detachment—touched, too, by nostalgia for a world that was disappearing even as he painted it,” Graham-Dixon observes. How do you observe Lent? While our culture tends to think of this period as a time of deprivation, many have come to regard it recently as a time to add a thoughtful discipline to usual routines. The camera heightens my powers of observation and awareness; this year it will become my faithful companion to document my personal understanding of photo-a-day words suggested as Lenten practice at The Upper Room’s Alive Now website. Christine Sine offers this thoughtful reflection on creating sacred space for Lent, and here’s a link to Sine’s Mustard Seed Associates’ Lenten reflections. You’ll find Carol Janus’ article on giving up plastic for Lent at this Center for a New American Dream blog post. Check them out and come up with your own authentic adaptation of what will make Lent a meaningful season of the liturgical year for you.